Derby's waste - a rubbish blog ! : Bins on streets - Section 46 can help ! Bins on streets - Section 46 can help ! One of the most important waste related things we all need as residents is a successful waste disposal system that manages waste sustainably. A disposal system needs to be easy to understand and simple to take part in when we as residents are expected to recycle our waste - as we should do. We create the waste so it is only right that we dispose of it safely and correctly. The trouble is some of us either don't understand the process of waste disposal - recycling being a prime example or we don't want to take part at all - we just like to consume and dump, consume and dump day in day out. If people don't understand the concept of recycling or simply don't care this can cause a number of issues. It can lead to bins being left unemptied if they contain items that should not be there. It can lead to lower value recyclate being gathered which may not impact on our council at first but long term can impact on values nationally and any falling price in recycling is a bad place to be because in the end that fall in prices finds its way back to the council via higher gate fees etc. Where bins are left on streets - be it a contaminated recycling bin, an empty recycling bin or simply just a residual waste bin this situation drags a community down. A street full of bins degrades a community causing a blight by blocking pavements, attracting side waste and fly tipping, all aspects we don't want to experience as residents in our community. This is a very common issue in Derby in a number of wards including Normanton, Arboretum and Abbey to name just three. 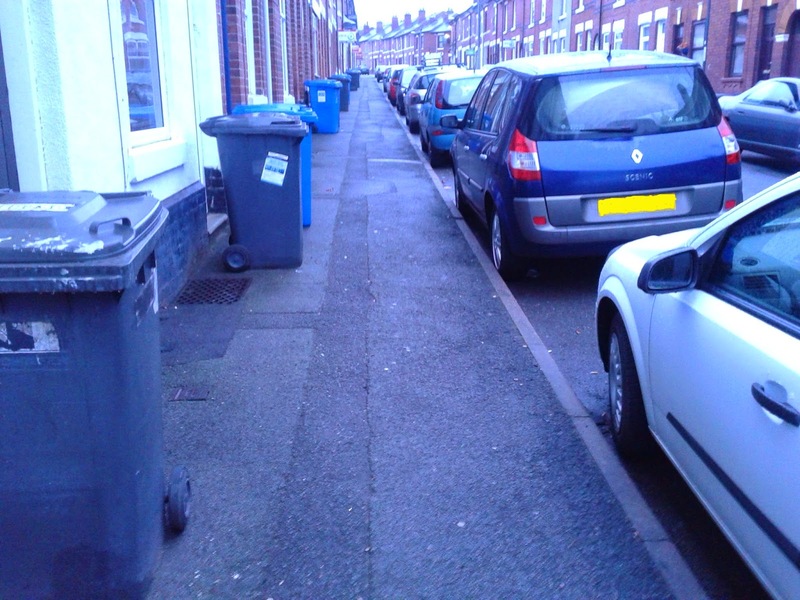 Sometimes residents have legitimate reasons for leaving bins on the streets such as lack of access to a rear garden. Sometimes the street is the only place for the bin in such cases but the council needs to confirm this is actually the case and not simply a lazy excuse. The council should also work to address access issues where possible - for example by clearing blocked alleyways or reviewing issues such as rights of access issues where a resident has blocked the ability of others to access properties from the rear by building fencing or planting hedging. There is one government act known as the Environmental Protection Act 1990 which gives councils the power if they choose to make residents remove bins from the street outside set collection periods. Section 46 of the act which focuses on household waste collection gives councils the power to set out times when it is acceptable to place bins on the street and allows for action to be taken if bins are in place outside this period. For Some reason Derby City Council are not using that ability and so the streets of Normanton, Arboretum, Abbey, Mackworth and other wards are left with streets full of bins which leads to recycling bin contamination and fly tipping. Is there a political will in Derby to use such powers or do those in power favour a cluttered street scene over making the electorate take responsibility for their waste disposal bins.